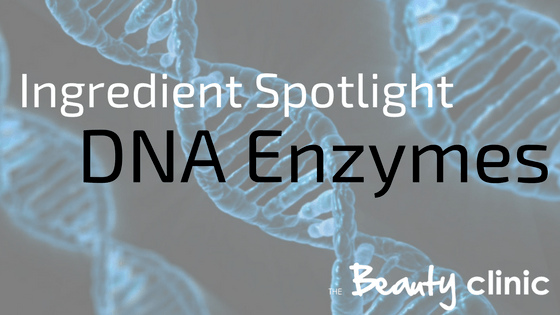 DNA Enzymes -Ingredient spotlight: & why are they in our skincare? In simple terms, DNA is complex molecule made up of various elements that live in each cell of our body. When it comes to cells in our bodies there are hundreds of different types, each performing a particular function, but cells also only have a certain lifespan and die. There are also other factors that can damage these cells before they are ready to die like sun exposure, pollution, sugar, alcohol, smoking, medications etc. For example, studies show sun exposure can induce cancerous DNA damage in skin cells leading to mutation that can lead to skin cancers. There is no physical DNA in skincare products but enzymes that help repair the damaged DNA in our skin. These repair enzymes occur naturally in our bodies but as we age these deplete and no longer have the ability to repair. Now we have the ability to supplement these natural enzymes to repair damaged DNA. It’s essentially Nature meets Science -These enzymes are all created biomimetically meaning we take a ‘natural’ source and replicate it in a lab ‘mimicking’ the natural source and its functions. This use of biomimetics means the cells will accept the enzyme as it is familiar to the body and will not be rejected or cause irritation like some other ingredients can. DNA enzymes sound like a miracle worker? Although this technology is incredible it is important to note that not all DNA damage can be repaired so PREVENTION is still the best defence. Once damage over years of neglect has accumulated there is no repairing the DNA. The most important being UV exposure and a simple task of wearing an SPF daily can protect our cells also the use of anti-oxidants to minimize the production of free radicals. We love Ultraceuticals Anti-oxidant complex. How can I get my hands on some of these amazing DNA enzymes? The most advanced global anti-aging treatment from mesoestetic® includes the innovative [meso]recovery complex®, a unique combination of active substances, specially selected for their cell DNA anti-oxidative, protecting and repair properties. mesoestetic® DNA Radiance Intensive cream – Global-acting antiaging cream created particularly for reactivating vital skin functions, strengthening the protective barrier action. 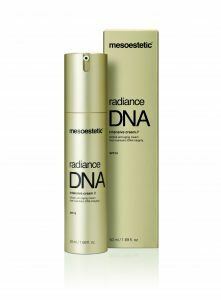 Radiance DNA intensive cream includes in its formula the powerful [meso]recovery complex® responsible for stimulating fibroblasts for collagen and hyaluronic acid production and improving the skin defence against oxidative stress. Bright and glowing, the skin recovers its elasticity and firmness and wrinkles gradually decrease. This facial treatment is the gold standard of facials with ingredients to give you an immediate lifting effect, fighting environmental aggressors and getting you on the road to DNA cell repair. 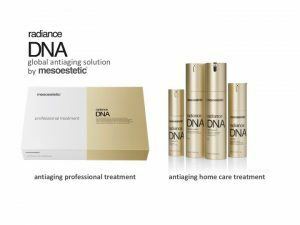 The DNA Radiance Professional treatment is available on The Beauty Plan, if you sign up to 5 treatment pack and receive the DNA Radiance intensive cream to take home free. Book in for a complimentary Skin Consultation.